A group of Tesla shareholders has questioned the independence of the electric carmaker's board, warning it is too close to boss and co-founder Elon Musk. In a letter, they said the board was "largely unchanged" since the firm went public and at risk of "groupthink". They urged it to re-elect members annually and to add two new independent directors to the board. In a tweet Mr Musk said the investors "should buy Ford stock" instead. The shareholders include the California State Teachers Retirement System, Hermes Equity Ownership Services and CtW Investment Group, among others, and collectively manage assets worth $721bn (£547.5bn). In a letter to Tesla lead independent director Antonio Gracias, they called for action before the firm launched its Model 3 sedan later this year - its first vehicle aimed at the mass market. 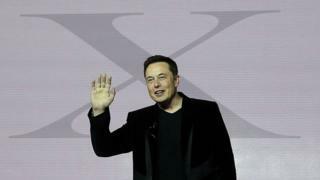 "While meeting the technical definition of independence, five of the six current non-executive directors have professional or personal ties to Mr Musk that could put at risk their ability to exercise independent judgment," the letter said. "A thoroughly independent board would provide a critical check on possible dysfunctional group dynamics, such as groupthink." With an almost Trumpian flair, Elon Musk has regularly used Twitter to sound off about his frustrations with Tesla's investors. With stock surging, he gloated that there was "stormy weather in ShortsVille" - a dig at those who shorted - sold - their Tesla stock believing its value was about to fall. On Wednesday, Mr Musk tweeted that the investment group should buy into Ford if they wanted a different corporate culture, a comment that has more weight now that Tesla is, according to market cap, worth more money. I don't see this demand gaining much traction. The concerned group thinks there are too many personal ties between board members at Tesla, potentially clouding judgement. But there are other investors who support Tesla precisely for that reason: it's Mr Musk's team, vision and ambition. And so far he's doing very well. Tesla board members include Mr Gracias, a shareholder and board member of SpaceX, another company controlled by Elon Musk; as well as Brad Buss, a former chief financial officer at solar power business SolarCity, which was founded by Mr Musk and later bought by Tesla. The $2bn deal was widely criticised on Wall Street and led to a 13% fall in Tesla's share price when it was announced last June. A Tesla spokesman said it regularly engaged with shareholders and valued their feedback. "We are actively engaged in a search process for independent board members, which is something we committed to do several months ago, and expect to announce new additions fairly soon." However, Mr Musk tweeted: "This investor group should buy Ford stock. Their governance is amazing..."
This month Tesla became most valuable US car company, beating General Motors for the top spot. Last year it sold 76,230 vehicles, missing its target of at least 80,000 cars sold. In comparison, GM sold 10 million cars and Ford sold 6.7 million.